Version 1/29/18 - To be published soon. Feel free to read, site and share. This book is intended to provide a roadmap to all school leaders and those who seek to understand and support the process of school improvement. This roadmap offers both a user-friendly understanding where any school is currently as well as a practical formula for how it can move from its existing location on the roadmap to greater levels of function and effectiveness. It will be your guide to promoting growth as a school or a collective of any kind. The benefits of that growth include improved performance, but also assume higher function, higher quality climate, as well as a school that embodies a greater sense of ease, sanity and satisfaction. So why do we need a roadmap to improve? As will become more evident as the book progresses, there are many reasons it is necessary. First, we do need a roadmap to have an operational understanding of where we are currently. Without that knowledge we lack the able to see and define our current situation clearly.� Second, we need a roadmap to know where we are going. What do we mean when we refer to concepts like �better� or �improved� or �higher performing?� So why this roadmap, in particular? For many reasons including its very sound theoretical basis, its ability to imply the practical specifics required to achieve results, and� because it is based in the process of natural human actualization and psychology and does not ask participants to violate their human nature or dignity or best instincts. We do not have to give up our best values to pursue excellence. Figure 1.1 depicts the broadest characterization of the school effectiveness roadmap. The more productive, effective and desirable locations on the roadmap are defined by higher levels of personal and collective function and empowerment. The vertical axis represents a continuum of function and intention. The horizontal axis reflects a contrast between empowerment and trust versus control and fear. Throughout the book as well as your process of school improvement it will be useful to keep in mind that both the nature of the more desirable locations on the roadmap and what it takes to move there will be inter-related. When your school ultimately demonstrates the values and practices defined by higher levels of vision, trust and empowerment we will find yourself experiencing all the benefits and outcomes that correspond to those higher locations along the pathway. Concurrently, what it will require for that movement to have occurred will be those same qualities. So in a very real sense the journey is the destination and vice versa. 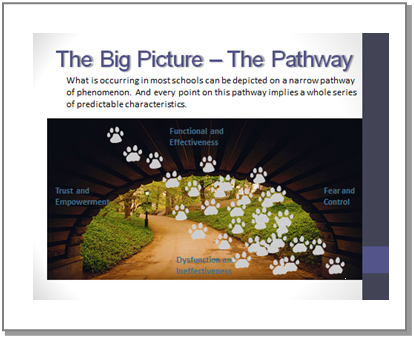 While the school effectiveness roadmap is somewhat complex � it will take us the first five chapters to fully build � when entirely represented it provides a rather complete macro theoretical foundation as well as the applied capacity to unpack the countless micro practical implications required for leading your school in the process of meeting its full potential. When we look at schools in general we find that there are countless ways to stay about the same and/or perform passably (which still typically involve an enormous amount of human effort), yet only a very narrow path to actualizing meaningful growth and improvement (that includes few if any short-cuts). This is true for individuals, teams, companies, and schools. The process will be similar. When we look at any collective organization closely, we see that groups at different points along the pathway are not only doing very different things, but they are trying to do very different things. One�s location on the roadmap will be defined by three inter-related variable 1) what we think and feel, which we will call references or R�s for short, 2) what we do � our practices and actions which we will call X�s for short, and what occurs as a result of what we do, which we will call our outcomes or O�s. We have collected data from hundreds of schools over the past few years and interviewed dozens of highly effective school leaders. What we have discovered is that where the school is located geographically tells us much less about it than where it is on the effectiveness roadmap. The reason is that the location of the references, practices and outcomes at any school will tend to be at the same location on the school effectiveness roadmap. So given the knowledge of either the common references, the common practices or the common outcomes, the roadmap will be able to accurately predict what the other two will be. Certain climates produce certain achievement levels, and certain practices produce certain kinds of climates. And most telling of all will be the references that inform the practice. So moving up the pathway to higher levels on the roadmap implies consideration for each of these factors, and addressing them all in the growth process. Reflection 1.A. : Recall the last effort that you were able to observe closely that was referred to as a program implementation. What happened to the program goals in the long-term? What forces limited the program�s effectiveness? Did staff buy in? Why or why not? NOTE: This is the first of many reflections that will be included in the chapters to encourage reflection on specific topics corresponding the text. The starting point is to recognize that �everything is connected.� Everything includes all the actions, methods, practices as well as all the thoughts, intentions, emotions, climate and culture. Denial of this fact is responsible for a vast amount of wasted time, money and effort (see Figure 1.2).� Often we hear someone say that �we need to do something at this school to . . . � The proactive and well intentioned sentiment is commendable. But it is useful to recognize that we are doing something at the school all day every day. While, sometimes it is useful to add a strategy or program into the mix to promote a positive outcome, no strategy can fix a fundamentally problematic context by itself. And more often than not what we find is that adding a series of add-ons into a school or classroom results in rather mediocre results. If the values/references within the context do not support the new practice it will be rejected eventually. Moreover, as one grows in understand the nature of what either creates or undermines function, what we see is that usually our school will improve more significantly by what we stop doing rather than something we add into the mix. When we examine what creates true improvement, higher levels of function and high quality outcomes, success is dependent on a series of complex but rather explainable factors such as vision, trust, function, climate, quality. These concepts can appear abstract and elusive, but in this book we will operationalize them, and explore how to promote them as practical realities. An especially critical quality indispensable to any effort toward meaningful growth will be vision. Too often we attach the vision in an organization to a person. Having leaders who possess visionary qualities will be useful indeed, but vision can be created within any group. Sustainable vision is an attitude, a set of practices and collectively and clearly setting our sites on a location on the roadmap. Vision is part of the culture of great schools, and something any school can begin to cultivate. While the definition of school improvement today is dominated by the interest in raising student achievement scores, and how we get there is given a much smaller consideration, the fact is that how we get there is the key to obtaining and sustaining higher levels of achievement. As a result of the external pressures to improve, and our experience with heavy handed external program �implementations,� we may associate improvement and change with something unnatural and forced. But the growth process, when approached with a sensitivity to how individuals and groups function, can be rather satisfying and rewarding. And the fact is that creating a healthy, functional and vision driven school is more likely to improve student achievement scores (as well as real student achievement by any definition) than trying to attack student achievement scores directly, with �programs.� The highest locations on the roadmap produce high student achievement as well as high student achievement scores, but it is also defined by a healthy climate, an emotionally sane and satisfying environment, meaningful learning and critical life lesson learning. There is no compartmentalization or compromise necessary. Every move up the pathway is innately more natural and enjoyable to those within the school. Figure 1.3 outlines some of the markers that we are successfully moving up the pathway. Need for telling, selling, bribing and coercing people to get them to perform well. Integrity of the efforts from leaders, teachers, staff and students in a direction that leads to growth. Disconnected action from leaders, teachers, staff and students that tends to add up the same old same old. Need for you to externally implement things onto others that are resisted, ignored and/or replaced later. A clear sense of the long-term and how today fits in. The feeling that what is necessary in the short term is all that one can handle in a typical day. A solid context (school and classroom climate and function levels) that allows for qualities such as creativity, trust and innovation to emerge naturally. School and classroom environments that perpetually requires so much management and maintenance that creativity and innovation become viewed as luxuries. A pervasive feeling of movement, growth and winning. Something is being built. The familiar feeling of the need to solve the same set of problems day in and day out. We are on a treadmill. After building the school effectiveness roadmap in chapters 2-5, in chapter six we examine how to cultivate a trust among leadership, teachers and staff and students within the school and the need to emphasize process values over outcome values. In chapter seven we look at the indispensable need for a guiding school vision and offer ideas for supporting this quality within the school. In chapter eight and nine, we explore how to support and encourage great practices and act as an expert instructional leader. In chapter ten we explore how to think about looking at data and recognizing and solving real problems rather than symptoms. In chapter eleven we take each of the eight dimensions of climate and examine their interdependence as well as their independent contributions to the overall climate of the school. Given that all schools are in different locations on the roadmap and thus the needs of their leader and the school as a whole will be different. Chapters twelve and thirteen are devoted to schools starting at two distinct location on the roadmap. Chapter twelve outlines that process of moving a school from a lower performing location to higher levels of function, a more positive climate and level of self-respect. Chapter thirteen explains how to go from good to great - how a school that is currently doing fine by most standards can move up the pathway and actualize more of its potential. 1. Willingness to become an expert in the nature of the roadmap and the mechanics of the change process. Much of it will resonate with your experience, and your instinctual sense of how things work, but there will also be some areas where your assumptions will be challenged and it may imply the need to change your thinking or your practices. Included in that willingness will be the need for patience with yourself, others and the process. If you are looking for quick fixed or clever strategies that you can use as short cuts to promoting meaningful and systemic change you will not find too many here. The effort here is to support your growth as a real leader not someone who is posing as one. 2. Commitment to a department, a school, or a district, team, institution, etc. This will imply time and a real concern for the wellbeing of those who you are entrusted to work with and lead. It will require an attitude of service and a sense of your purpose as a leader. 3. Openness to cultivating a vision. Your success will be dependent on your ability to see within the institution the highest good and nurturing a shared vision among the collective. You will need to develop the personal skills, knowledge and dispositions to inspire others to see a more functional, empowered, and satisfying place that can emerge out of the current state of affairs.